Crystal formation plays a defining role in the pathogenesis of a range of common diseases, such as gout and atherosclerosis. LMU researchers led by Hans-Joachim Anders have now elucidated how the insoluble deposits induce cell death. The formation of crystalline deposits in the extracellular medium is a defining feature of several widespread illnesses. Examples of such ‘crystallopathies’ include gout, atherosclerosis and kidney disease, which are associated with the precipitation of urate, cholesterol and oxalate crystals, respectively. In these and other similar cases, exposure to crystalline microparticles not only provokes an immune reaction that initiates a chronic inflammatory process, but also results in cell death. Now a team of researchers headed by LMU’s Professor Hans-Joachim Anders at the Department of General Medicine and Nephrology (Medical Clinic IV, Downtown Medical Campus) has uncovered the mechanism by which such crystals set off the train of events that leads to cell death. The new findings are of significance for many different disorders, including the conditions mentioned above. The study appears online in the journal "Nature Communications". Crystalline deposits provoke extensive tissue damage and can even lead to organ failure. Moreover, crystal-linked conditions exhibit common features, which suggest that they all share the same underlying mode of pathogenesis. Up until now, researchers have regarded inflammation as the primary damage mechanism, and have therefore focused on the issue of how crystals trigger inflammatory reactions. 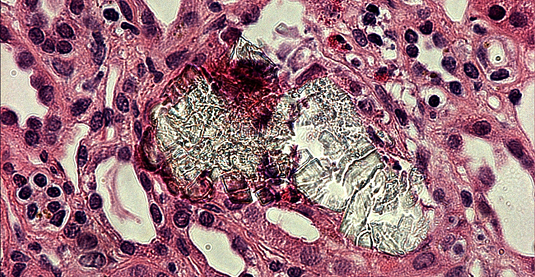 But Hans-Joachim Anders and his colleagues have now shown that the different types of crystals all initiate an active process that leads to cell necrosis. “Cell death in this context has hitherto been regarded mainly as a passive process of cell loss due to irreparable damage. But we have now demonstrated that it is the outcome of a regulated process, which actively eliminates cells,” Anders explains. This last finding is important because therapeutic strategies employed in the treatment of such diseases have so far concentrated on inhibiting the inflammation reaction. However, the discovery that the cytoxic effect of the crystals is itself actively regulated now offers a new target for drug therapy. “The components of the signal pathway could offer new targets for therapeutic drugs. Pharmacological blockade of its action should prevent crystal-induced cell death,” Anders says. And according to the new study, that should also be sufficient to impede the development of chronic inflammation. However, whether or not this innovative approach will actually result in practical improvements in the treatment of patients is a question that can only be answered by further research.